Background/Aims: The transition of adolescents with inflammatory bowel disease (IBD) from pediatric to adult care requires a well-structured standardized protocol to ensure the delivery of optimal healthcare and decrease the risk of nonadherence, hospitalizations, and complications. The aims of this survey are to evaluate current IBD transition practices adopted by gastroenterology services across the Kingdom of Saudi Arabia (KSA) and to identify the major challenges standing in the way of implementing effective transition strategies from the perspectives of pediatric and adult gastroenterologists. Patients and Methods: An online survey was distributed to KSA pediatric and adult gastroenterologists through the Kingdom's national gastroenterology association. The questionnaire included closed-ended questions regarding existing institutional transition strategies and perspectives regarding the impact of different factors on their ability to effectively transition adolescents from pediatric to adult care. Results: A total of 80 adult and pediatric gastroenterologists responded to the survey invitation. Most of the participating gastroenterologists worked at a tertiary care center (82.5%). The majority of gastroenterologist (73.8%) reported that they do not follow a defined protocol for transitioning in their current practices. However, a structured transition program was noted to be “very important” by 78.8% of gastroenterologists. The most favored method of transitioning was joint outpatient clinic attended by patient, caregiver, pediatric gastroenterologist, and adult gastroenterologist (35.9%) and the most commonly reported barrier to transitioning was “lack of proper preparation” for transitioning (53.2%). Conclusions: Although acknowledged by the majority of participants as being “very important,” no standardized IBD transition protocol is followed in the majority of practices across KSA. A well-structured national protocol for transitioning adolescents with IBD is needed. Inflammatory bowel disease (IBD) is a disease entity that includes both ulcerative colitis (UC) and Crohn's disease (CD). Worldwide, a rapid surge in IBD incidence is being observed., Much of the disease burden can be attributed to incident cases in the pediatric population. A French population-based study reported an increase in the incidence rate of early-onset IBD from 4.4/1000000, which was reported between 1988 and 1990, to 9.5/1000000 that was reported between 2009 and 2011. In agreement with the above study, a study from a well-defined national registry in Finland showed an increase in the incidence rate of pediatric IBD patients by 23/100000 among children less than 20 years old and 13/100000 for those less than 16 years old during the period between 2011 and 2014. In these two populations, the incidence rate of very early-onset pediatric IBD patients remained stable. However, a study by Benchimol et al. in 2014 reported an increase in the standardized incidence rate from 9.4/100000 in 1999 to 13.2/100000 in 2009 for all pediatric age groups. Similarly, a recent study from the Kingdom of Saudi Arabia (KSA) has reported a significant increase in the incidence rate of pediatric IBD between 2003 and 2012. In the pediatric population, IBD manifests as a more extensive and severe phenotype  and as these patients grow older, they are eventually transferred from pediatrics to adult healthcare. Transition, in the context of healthcare, has been defined as “the purposeful, planned movement of adolescents with chronic physical and medical conditions to adult-orientated healthcare systems.” The transition of adolescent with IBD from pediatric to adult care is considered a stressful phase for pediatric IBD patients. Transitioning therefore requires a well-structured standardized protocol that ensures the delivery of optimal healthcare and decreases the risk of nonadherence, hospitalizations, and complications. Because of these challenges, the European Crohn's and Colitis Organization (ECCO) guidelines recommended the formation of adolescent transition clinics that facilitate transitioning through a multidisciplinary approach. Other transition strategies that have been utilized include having a pretransfer scheduled visit at the adult gastroenterology clinic, alternating visits between pediatric and adult gastroenterologists for a period of time, or attending multidisciplinary team meetings. The aims of this study were to evaluate current IBD transition practices adopted by gastroenterology services across KSA and to identify the major challenges standing in the way of implementing effective transition strategies from the perspectives of pediatric and adult gastroenterologists. We performed a nation-wide cross-sectional survey of all adult and pediatric gastroenterologists currently practicing in KSA. An online survey was delivered to pediatric and adult gastroenterologists practicing in KSA through the Kingdom's national gastroenterology association. The questionnaire included 10 closed-ended questions regarding existing institutional transition strategies and preferred methods of transitioning [Table 1]. Participants were also asked about their perspectives regarding the impact of different factors on their ability to effectively transition adolescents from pediatric to adult care [Table 2], [Table 3], [Table 4]. We conducted this survey with ethical standards consistent with the declaration of Helsinki. Survey responses were collected from 80 of 306 adult and pediatric gastroenterologists (26%), most of whom practiced at tertiary hospitals (82.5%). The majority (73.75%) reported that they do not follow a defined transition protocol in their practice. However, most physicians (79%) rated having a well-structured transition protocol as being “very important.” The majority of respondents chose “joint outpatient clinic attended by patient, caregiver, pediatric gastroenterologist, and adult gastroenterologist” as the most favored method of transitioning. Additionally, more than half of the participating gastroenterologists reported that they lacked proper preparation for transitioning pediatric IBD patients to adult care. Moreover, 57% of gastroenterologists reported that they encountered less than 6 patients a year who were in the process of transitioning from pediatric care to adult care [Table 1]. The majority of participating gastroenterologists reported age (43.8%) and marriage (31.65%) as “very important” determinants of the ideal timing for transfer [Table 2]. Forty six percent of participants thought that readiness of patients as judged by caregiver to be an “important” determinant of timing of transfer. 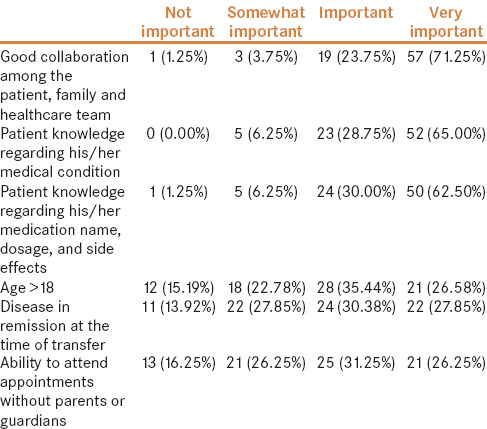 Gastroenterologists ranked a variety of factors on a scale of “very important” to “not important” in determining the success of transitioning [Table 3]. Most gastroenterologists reported good collaboration among all stakeholders (71%) as “very important” followed by patient's knowledge about his/her medical condition (65%), and patient knowledge regarding his/her medications (62%). Gastroenterologists also ranked various factors that would impede the success of transitioning. The majority of gastroenterologists reported poor coordination between care providers (59%) and difficulty in accessing medical records (54.4%) as “very important” [Table 4]. Emerging illnesses such as IBD often occur in multiple age groups leading to a gradual increase in incidence and ultimately prevalence rates, especially in older age groups, unless there is an increase in mortality or discovery of a cure. While the prevalence of chronic illnesses can increase in adults, it typically remains stable in the pediatric patient population despite increases in incidence rates. This phenomenon is mainly attributed to the transfer of patients from the pediatric to adolescent age group, which means that much of the disease burden currently observed in adults originates from patients diagnosed in childhood. Acknowledging that this is a source of significant disease burden is important from a public health standpoint, as various strategies are being developed to counteract the sudden rise in IBD incidence rates worldwide. Moreover, understanding the impact that proper transitioning might have on the course of illness of patients with IBD is equally significant. 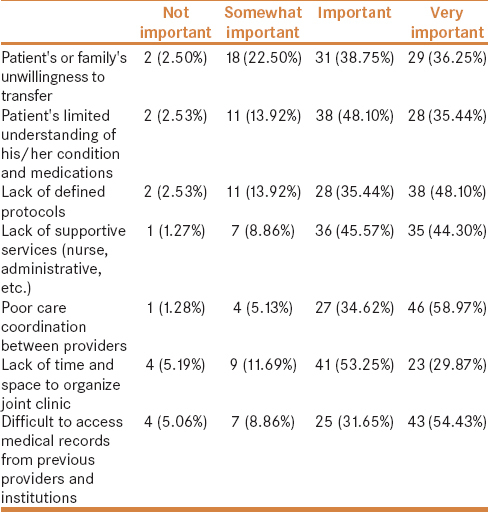 Our results indicate that only 26% of medical centers in KSA follow an institutionally developed protocol for transitioning IBD patients to adult care although 79% of participants rated transitioning as being “very important.” This discrepancy supports the fact that physicians on an individual-level acknowledge the importance of transitioning of care and that interventions are needed on a national scale rather than on the level of physicians or even institutions. Although the question of how to properly transition adolescents with IBD to adult care is being widely addressed by researchers, standardized protocols have yet to be established. However, recently published literature provided recommendations and guidelines that can be utilized to achieve smooth transitioning of care.,, Dabadie et al. implemented a transition model involving joint pediatric–adult care visit before completely transferring patients to adult care. The majority of patients (85%) and their parents (74%) taking part in this transition model reported readiness and comfort following transition. Moreover, an established transition program for IBD patients in the Netherlands supports the notion that joint clinic visits can improve the readiness for transfer among IBD patients. Conversely, several studies have also highlighted the current deficiency that exists in transitioning of care for adolescents with IBD., Studies involving hereditary diseases such as cystic fibrosis and sickle cell disease clearly show improvement in outcomes when transition protocols are in place. Furthermore, standardized transition protocols for some illnesses, although not necessary, have also led to better care through transition clinic. A study by Holmes-Walker et al. that involved 191 patients with type 1 diabetes demonstrated improvements in glycemic control and reduction in DKA-related hospitalizations after providing a transition support program that was “designed to assist young people as they moved from pediatric to adult health services, and to remain under a system of care including a diabetes specialist, primary care physician and diabetes educator.” The success observed with these programs suggests that structured transitioning in general delivers better care and possibly favorable long-term outcomes. 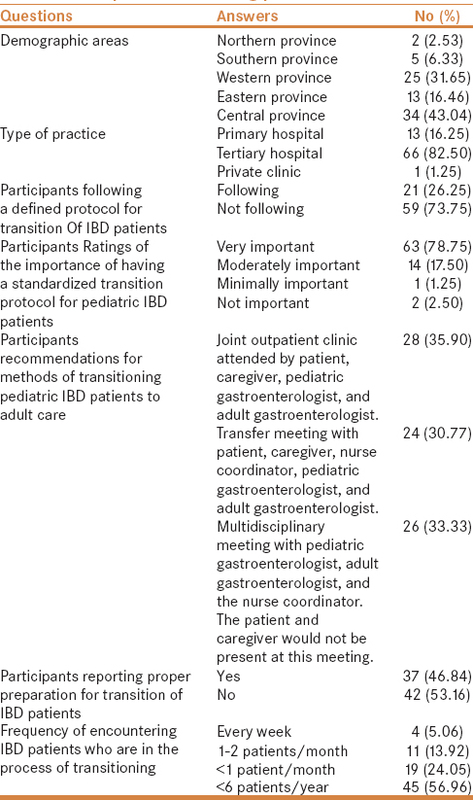 Based on our results, gastroenterologists seem to slightly favor having a joint outpatient clinic attended by patient, caregiver, pediatric gastroenterologist, and adult gastroenterologist to transition patients over other forms of transitioning, and this might be a reasonable yet resource-intense interim method that can be used to transition IBD patients until the optimal transitioning method is identified. Having a standardized protocol for the transition of IBD patients in KSA may have a positive effect on patients' attitude toward their illness, as anticipating transition can be emotionally and physically stressful to patients, and may hopefully lead to better self-efficacy, patient compliance with therapy, and finally ensure the delivery of high-quality healthcare services to IBD patients across both private and public medical facilities. Studies that have compared long-term outcomes before and after the introduction of standardized transition protocols are needed to support this theory. A retrospective case-controlled study by Goodhand et al. assessed IBD outcomes in adolescent patients after they attended adolescent IBD transition and clinics reported a decrease in radiation exposures and better medication adherence. Similarly, a study by Cole et al. concluded that “transition programs may have a positive impact on important disease outcomes such as surgery and hospitalization rates in IBD patients” 2 years after forming an IBD transition clinic. A summary of studies that have investigated the effect a well-structured transition strategy might have on IBD disease outcomes is summarized in [Table 5].,,,,,,, Such reported impacts of structured transitioning on disease outcomes warrant further investigations on a national scale in developing countries. We acknowledge that this study has several limitations including using a nonvalidated questionnaire to survey participants and a small sample size due to the low response rates. Larger well-designed national surveys are needed to further investigate the ideal method of transitioning and identify barriers to proper transitioning of IBD care in developing countries. Adult and pediatric gastroenterologists practicing in KSA acknowledge the importance of having a standardized transition of care protocol for adolescents with IBD. The impact such an intervention might have on quality of care and long-term IBD outcomes are yet to be determined. Van Limbergen J, Russell RK, Drummond HE, Aldhous MC, Round NK, Nimmo ER, et al. Definition of phenotypic characteristics of childhood-onset inflammatory bowel disease. Gastroenterology 2008;135:1114-22. Benchimol EI, Mack DR, Nguyen GC, Snapper SB, Li W, Mojaverian N, et al. Incidence, outcomes, and health services burden of very early onset inflammatory bowel disease. Gastroenterology 2014;147:803-13. Bequet E, Sarter H, Fumery M, Vasseur F, Armengol-Debeir L, Pariente B, et al. Incidence and phenotype at diagnosis of very-early-onset compared with later-onset paediatric inflammatory bowel disease: A population-based study [1988–2011]. J Crohn's Colitis 2017;11:519-526. Virta LJ, Saarinen MM, Kolho KL. Inflammatory bowel disease incidence is on the continuous rise among all paediatric patients except for the very young: A nationwide registry-based study on 28-year follow-up. J Crohn's Colitis 2016;11:150-6. Blum RW, Garell D, Hodgman CH, Jorissen TW, Okinow NA, Orr DP, et al. Transition from child-centered to adult health-care systems for adolescents with chronic conditions. A position paper of the Society for Adolescent Medicine. J Adolesc Health 1993;14:570-6. Goodhand J, Dawson R, Hefferon M, Tshuma N, Swanson G, Wahed M, et al. Inflammatory bowel disease in young people. Inflamm Bowel Dis 2010;16:947-52. Bollegala N, Nguyen GC. Transitioning the adolescent with IBD from pediatric to adult care: A review of the literature. Gastroenterol Res Pract 2015;2015:853530. Baldassano R, Ferry G, Griffiths A, Mack D, Markowitz J, Winter H. Transition of patients with inflammatory bowel disease from paediatric to adult care: Recommendations of the North American Society of Paediatric Gastroenterology, Hepatology and Nutrition. J Pediatr Gastroenterol Nutr 2002;34:245-8. Hait E, Arnold JH, Fishman LN. Educate, communicate, anticipate-practical recommendations for transitioning adolescents with IBD to adult health care. Inflamm Bowel Dis 2006;12:70-3. Dabadie A, Troadec F, Heresbach D, Siproudhis L, Pagenault M, Bretagne JF. Transition of patients with inflammatory bowel disease from pediatric to adult care. Gastroentérol Clini Biolo 2008;32:451-9. Sebastian S, Jenkins H, Lindsay J, Ahmad T, Arnott I, Russell R, et al. The requirements and barriers to successful transition of adolescents with inflammatory bowel disease: Differing perceptions from a survey of adult and paediatric gastroenterologists. J Crohn's Colitis 2012;6:830-44. Paine CW, Stollon NB, Lucas MS, Brumley LD, Poole ES, Peyton T, et al. Barriers and facilitators to successful transition from pediatric to adult inflammatory bowel disease care from the perspectives of providers. Inflamm Bowel Dis 2014;20:2083-91. Tuchman LK, Slap GB, Britto MT. Transition to adult care: Experiences and expectations of adolescents with a chronic illness. Child Care Health Dev 2008;34:557-63. Sattoe JNT, Peeters MAC, Hilberink SR, Ista E, van Staa A. Evaluating outpatient transition clinics: A mixed-methods study protocol. BMJ Open 2016;6:e011926. Holmes-Walker DJ, Llewellyn AC, Farrell K. A transition care programme which improves diabetes control and reduces hospital admission rates in young adults with Type 1 diabetes aged 15-25 years. Diabet Med 2007;24:764-9. Cole R, Ashok D, Razack A, Azaz A, Sebastian S. Evaluation of outcomes in adolescent inflammatory bowel disease patients following transfer from pediatric to adult health care services: Case for transition. J Adolesc Health 2015;57:212-7. Hait EJ, Barendse RM, Arnold JH, Valim C, Sands BE, Korzenik JR, et al. Transition of adolescents with inflammatory bowel disease from pediatric to adult care: A survey of adult gastroenterologists. J Pediatr Gastroenterol Nutr 2009;48:61-5. Wright E, Williams J, De Cruz P, Andrews JM, Day AS, Moore D, et al. Perspectives of paediatric and adult gastroenterologists on transfer and transition care of adolescents with inflammatory bowel disease. Int Med J 2014;44:490-6. El-Matary W. Transition of children with inflammatory bowel disease: Big task, little evidence. World J Gastroenterol 2009;15:3744-7.
de Silva PS, Fishman LN. Transition of the patient with IBD from pediatric to adult care: An assessment of current evidence. Inflamm Bowel Dis 2014;20:1458-64. PLevinsky JM, Gumidyala AP, Fishman LN. Transition experience of young adults with inflammatory bowel diseases (IBD): A mixed methods study. Child Care Health Dev 2014;41:755-61. Bennett AL. Outcomes and patients' perspectives of transition from paediatric to adult care in inflammatory bowel disease. World J Gastroenterol 2016;22:2611-20. Goodhand J, Hedin CR, Croft NM, Lindsay JO. Adolescents with IBD: The importance of structured transition care. J Crohn's Colitis 2011;5:509-19. Gray WN, Maddux MH. Current transition practices in pediatric IBD. Inflamm Bowel Dis 2016;22:372-9.